Tartan Noir is a wonderful thing, but even its most enthusiastic adherents would have to acknowledge that there are certain patterns that have become established over the years that add a degree of predictability to the genre. 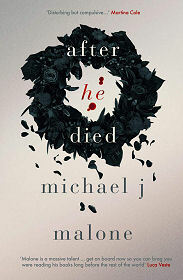 One of the things that makes "After He Died" by Michael J Malone such an outstanding book is that it defies just about every convention you care to name. Add this to a superbly-crafted story, highly convincing characters and a growing atmosphere of mystery and menace and the result is an outstanding book: a crime thriller that grips you from the start and leaves you wanting to find out what really happened, what is going to happen, and why. Paula Gadd's husband of nearly thirty years, Tommy, has died of a heart attack, leaving her bereft. The fact that his death was within days of the seventh anniversary of the death of their only son in a hit-and-run incident just makes things worse. Paula wafts through the funeral in a fog of prescribed medication and just about survives the experience. That is, until a young woman she doesn't know whispers something other than the ritual "I'm sorry for your loss" in her ear and puts a slip of paper in her pocket. It seems the young woman thinks she knows something about Tommy that Paula doesn't. And so we embark on a compelling journey as we follow Paula's efforts to cope with the fear that her husband wasn't all he had seemed to be: or perhaps that he was much more than he seemed to be, that there was a dark side to him that she never even glimpsed. The mysterious woman's story, once Paula makes contact, is so incredible it cannot possibly be true. Can it? Tommy's two brothers are of little help, as each seems to know more than they are prepared to tell her. But why? And Tommy's business partner begins to act very strangely indeed. The action moves from Glasgow to the Isle of Bute and back as Paula tries to come to terms with her loss, a process that is made much harder by her growing doubts that she really knew very much at all about the man who was such a huge part of her life for three decades. And then the brooding sense of menace gives way to violence and death and Paula realises that everyone who knew Tommy could be in real danger: and that she certainly is. "After He Died" builds in a very measured way to a beautifully constructed climax that has some nicely veiled twists and turns. It is a highly enjoyable and memorable example of Tartan Noir: and all the better for being so far removed from all the established norms of the genre.